Encouraging your employees to join your organization in the fight against hunger will help empower your workforce to take an active role in a cause that is important to your business and brand. 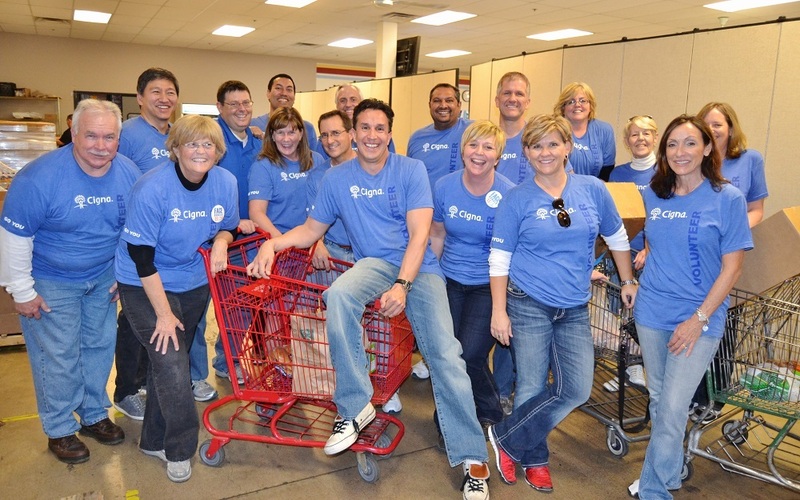 It’s also a great way for your company to deepen your community impact in Arizona. Workplace Giving Campaign: Allow employees to make convenient, tax-deductible donations to St. Mary’s through payroll deductions. Drive campaign participation rates by including St. Mary’s as one of your partner charities and inviting us to host a table or presentation at your kick-off event or charity fairs. Virtual Food Drive: Set a fundraising goal for your workplace and St. Mary’s will customize a secure, co-branded web page for your employees to provide tax-deductible donations online. Plan a special celebration when the goal is met! Make Hunger Disappear: Stack cases of cans to spell the word HUNGER at your site. For every $5.00 donation to St. Mary’s from employees, the cases are removed, therefore erasing the word HUNGER. Internal Fundraising Event: Encourage employees to donate food or funding in a unique way – “jeans days for a cause,” marathon or walk-a-thon teams, employee bake sales, potluck parties, 50/50 raffles or a department silent auction can help spur employee enthusiasm for participation. Matching Gifts: Remind employees to take advantage of your matching gifts program throughout the year. This powerful incentive is a wonderful way to show support for your employee’s dedication to fighting hunger. Volunteer Grants: Provide special recognition and incentives for employee volunteerism by providing a grant to St. Mary’s in return for their generous service. Celebrate their contributions with a check presentation with St. Mary’s staff. Employee or Customer Tributes: Extend a meaningful gesture to an exemplary employee or dedicated client/vendor by providing a donation to St. Mary’s on behalf of their birthday, work anniversary, retirement or in lieu of a holiday gift.